Mail Box Alert Flag signals when your mail has arrived. No need to walk to the curb in rain, snow, heat or cold just to check an empty box. Make your snail mail more convenient. Perfect gift for seniors, the handicapped or just plain busy folks. 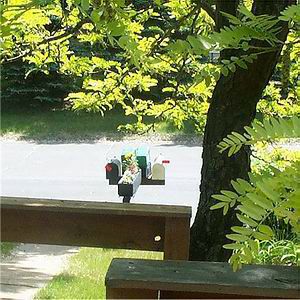 Imagine being able to just glance out the window to see if the mail has arrived. No more trudging through the snow or braving the rain only to find that the mail carrier hasn't yet arrived. What a fabulous gift for friends or relatives, to save time and effort, the type of gift that actually gets used and not just set aside and forgotten. 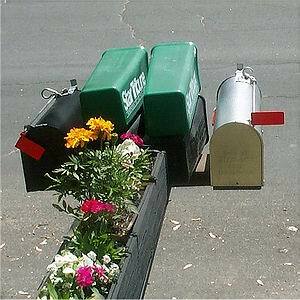 All you have to do is look at the box to see if the mail carrier has come by. The flag still up (on the right) means no mail. The flag has dropped (on left) means that you have mail! It's just that easy. No springs, magnets, switches or batteries to deal with - EVER! So simple to use even for children. 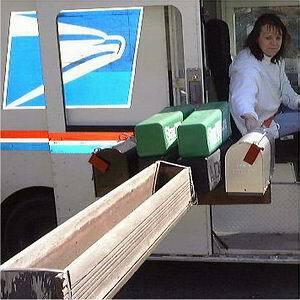 Your postal carrier simply opens the door of your mail box just like before. Your Mail Box Alert Flag will drop automatically to signal you that mail has been delivered. Remember, no springs, magnets, switches or batteries to deal with or replace! Imagine being able to just glance out the window to see if the mail has arrived instead of trudging out in the rain or snow - or taking a quick peek as you get ready to settle out on the deck with your coffee for a break. Your Mail Box Alert Flag keeps watch for you and lets you know with just a glance. We've decided that since we aren't real comfortable with using credit and debit cards online that we will offer the same security that we, ourselves, prefer. We will happily take your order by mail (please allow 2 weeks for checks to clear, money orders can be shipped ASAP) just drop me an email for details.